Road marathon: Lots of speedwork, running up and down hills in all weathers and trialling different gels. Bacchus marathon: Lots of intensive wine drinking. Road Marathon: Pacing around nervously, eating a carefully prepared breakfast and worrying about safety pins. Bacchus Marathon: Sit around drinking coffee in leisurely manner, worry about forgetting truncheon. Road Marathon: Precise distance of 26.2 miles to cover in a goal time. Bacchus Marathon: Decide while running whether to do the half or the full marathon. Spot the wine stations. Decide it would be a shame not to go round a second time. Time goal: however long it takes to visit 15 wine stations. Road Marathon: Skin tight lycra, club vest, sports bra and technical socks all carefully tested beforehand. Bacchus Marathon: Rock up in fancy dress outfit and hope the chafing isn’t too bad. Decide that enough wine will take mind off any chafing problems. Strategy: if I can feel the chafing, I need more wine. Road Marathon: A long line of runners emitting nervous farts and wondering whether they’ll have time to queue again before the starting gun. 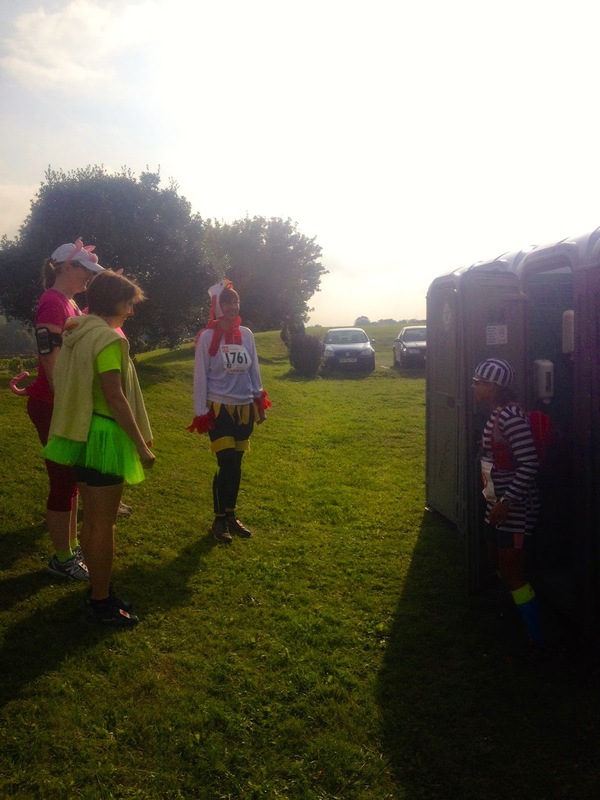 Marathon: Portaloo queue looks like Marvel Comics and Farmyard Weekly have merged. Road Marathon: Race Director is serious man with big stopwatch. 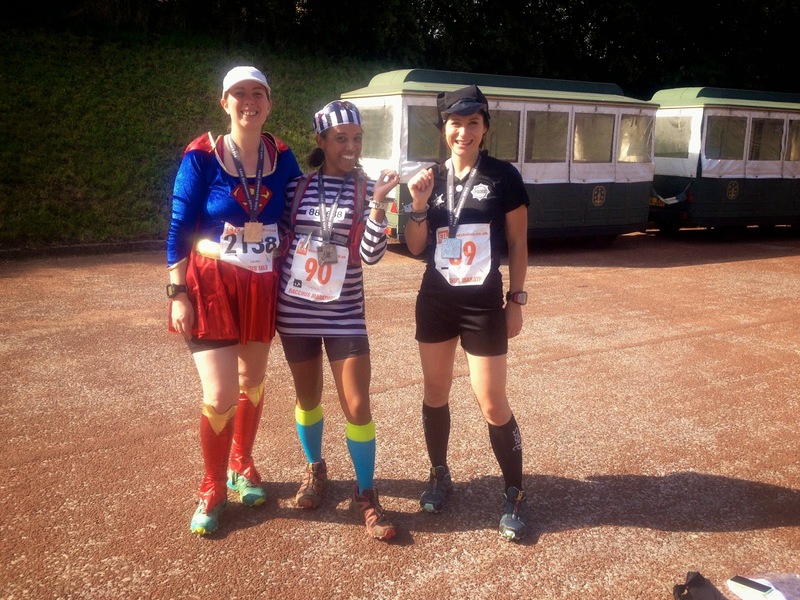 Bacchus Marathon: Race Director is serious man in Wonder Woman outfit. Road Marathon: Run up all the hills no matter what. Do NOT allow inclines to affect pace. Bacchus Marathon: Walk up ALL hills including speed bumps. No point wasting wine-drinking-energy. Road marathon: Never drink alcohol during training. Apparently even seeing alcohol can cause The Wall to hit early, your legs to fall off and your gels to spontaneously combust. Bacchus Marathon: Drink all the wine. Have two. Then do another circuit of wine stations to ensure none missed on first lap. Road Marathon: Careful fuelling strategy involving gels every 24 minutes or when you pass a km sign ending in a 5 or a 0. Or a lady wearing purple boots. Or a sad dog. Bacchus Marathon: As much pick’n’mix as you can eat before the marshals chase you away. Also melon, pineapple, cake, bananas and wine. Road Marathon: Mantra involves something along lines of “Die but never fail” or “Never stop running even if you’re dying. Think of the medal”. Road Marathon: Mainly buildings and spectators. Occasionally hedges. Bacchus Marathon: Rows of grapevines, beautiful views across the valley, wild cyclamen growing between the trees, rocky trails and tables spread with pick’n’mix and wine. Did I mention the wine? Road Marathon: Competitive, neurotic, dressed in lycra. Unable to chat in case they forget their race mantras which they are repeating over and over. Bacchus Marathon: Dressed as farmyard animals, in togas or as something completely random. Chatty, friendly and desperate to get to the wine. Road Marathon: Grateful to get water at water stops. Bacchus Marathon: Suggest a cheese board to go with the wine. Road Marathon: Grimaces, tears, forced smiles at photographers making runner look as though they’re fighting constipation. Bacchus Marathon: Wine giving you dodgy eyesight. And making the hills steeper on lap 2. Causing hedges to occasionally jump into the road. Road Marathon: Pace, pace, pace! Keeping a steady pace and never deviating for fear of missing a PB. Bacchus Marathon: Running like mad to get to the next wine station, then stopping to drink as much wine as possible. Also walking up hills. Walking bumpy bits. Walking after wine stations. Stopping to chat to marshals. Walking to eat snacks. Stopping to drink wine. And repeat. Road Marathon: An occasional escaped dog or dive-bombing pigeon. Bacchus Marathon: Escaped bull. Was told to walk down the hill due to escaped bull. Unsure why walking was better than running but couldn’t outrun a bull while tipsy anyway. Made sure to refuel (hic!) properly at next aid station in case need extra energy in event of bull chase. 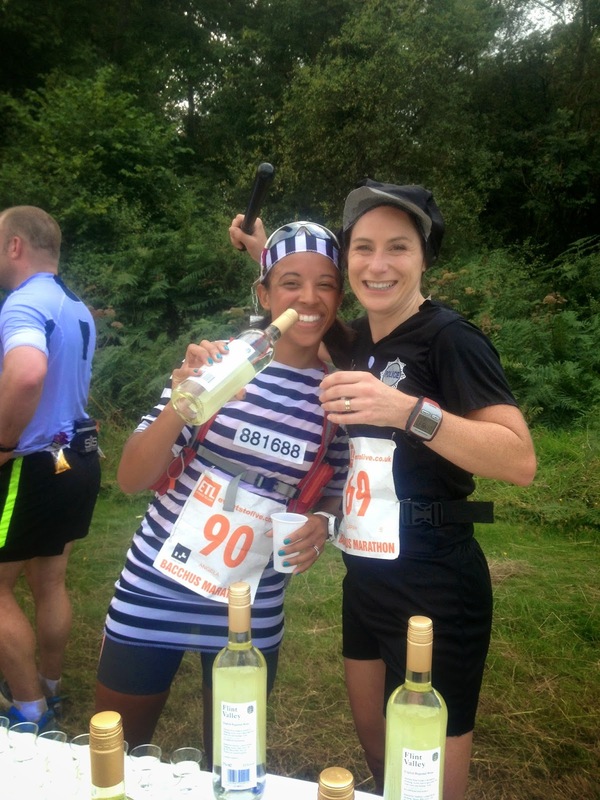 Bacchus Marathon: Big smiles, t-shirt, MASSIVE medal, fruit, hog roast and glass of wine at finish line. Road Marathon: Swear never to do it again. Bacchus Marathon: Promise to do it again next year. You can enter for 2015 here ... but save a space for me! The Bacchus sounds like my kind of marathon!! Dana - it was BRILLIANT!! I am definitely heading back again next year! Gorgeous route and so much fun. And SO much wine! !